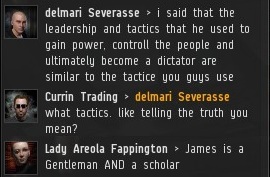 What my alt said is true. I have no ambition to become absolute ruler; I would only do it if I had no other choice. My humility is a huge barrier to tyranny. 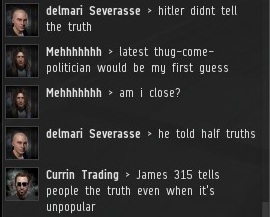 Despite my benign intentions, some residents of highsec harbor paranoid concerns about me making myself a dictator. Julius Caesar had to deal with the very same kind of nonsense. A fair number of people compare me to Hitler, but the analogy always breaks down when they're asked to provide an example of a similarity. 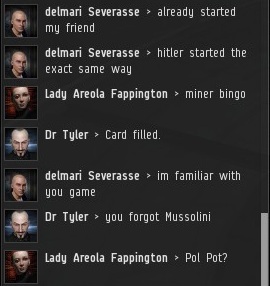 I consider myself Hitler's mirror opposite. Think of a Hitler fact, invert it, and you've probably got the beginnings of a good description of me. On the other hand, the New Order is aptly named: We're something completely new. There's never been a movement quite like ours, so comparisons tend to fall flat. But who needs comparisons when you've got capital letters? 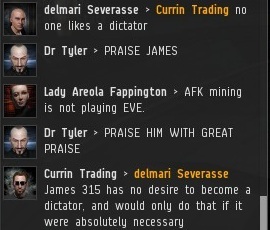 New Order role-playing fluff aside.. how do you respond to be accused of being a cyber-bully? 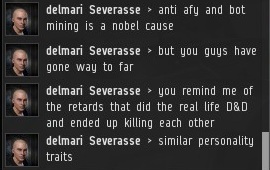 Is killing another player in a FPS being bully? Is winning a poker hand with a bluff being a bully? 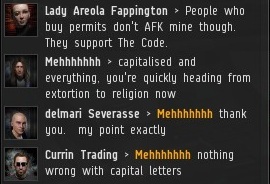 This leads to: is playing the game by the rules set by CCP being a cyber-bully? You answer.